10 Off-Shoulder Looks We Want To Steal From Our FAV Celebs! Our fave Bollywood babes keep us glued to their style always. Be it any trend, from high waist pants to off shoulder tops, they nail it Every.Single.Time. So, we are here with a little style inspiration for you from our very own Bollywood divas. We selected the best celebrity off the shoulder looks that we love, which would make you want to steal their clothes right away. Image: Tanya Ghavri On Instagram Have whites ever looked so surreal? Well, they might have, but this look is still our favourite. We just love Nimrat Kaur’s Gauri and Nainika off shoulder dress that is so sophisticated and trendy at the same time. With minimal makeup and black pumps, she has nailed it like a boss! Image: Ami Patel On Instagram Sayami is totally nailing the casual look like a boss! Look at the way she has paired up a simple white crop top with flared jeans for a look that is totally on-point. 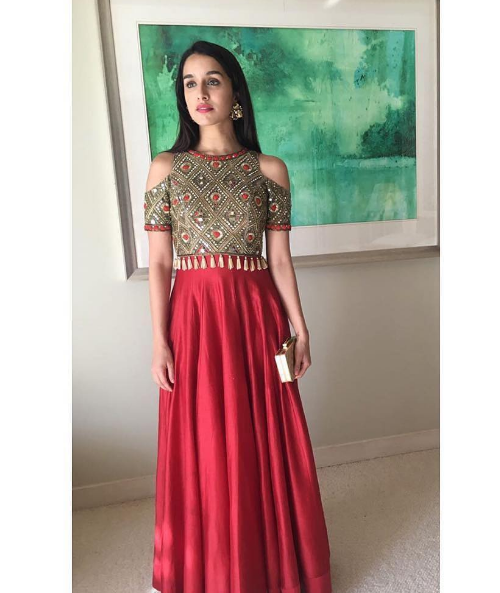 Image: Shraddha Kapoor On Instagram What do you wear to your best friend’s wedding? An embellished, cut-out shoulder top and a long skirt with a biiiiigggg smile! Sorted for life, eh! We so desperately want Shraddha Kapoor’s jewelled cold shoulder crop top and the gorgeous silk skirt, someone please get us one?! We can’t stop fangirling, can you?